You’ve got more access to the best software development talent on the planet than ever before. Isn’t it time offshore partnerships delivered the software success you always wanted? Anyone can find an offshore or nearshore vendor to build software. But, not everyone can create global partnerships that work. Accelerance is the leading advisory company coaching clients to unmatched success with global software development. Tech and business leaders often struggle to outsource software successfully - not because of the skills and talents of the global partner - but because of internal factors that prevent success. Accelerance consultants work with your internal team to examine outsourcing readiness and mitigate risks before we pair you with the perfect partner. Better strategies means better return on your software development investment. Accelerance software development outsourcing consultants have decades of experience launching and managing software outsourcing relationships. From this unmatched experience, we’ve identified a unique management approach to software outsourcing which complements your software development lifecycle. We call it the Software Outsourcing Lifecycle™. 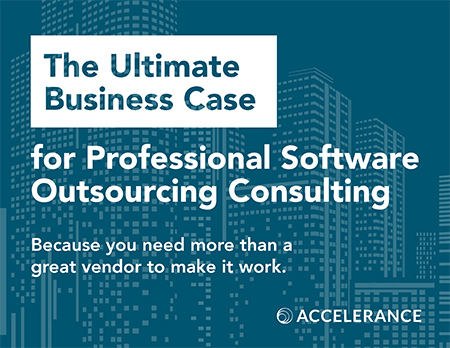 Avoid the biggest mistake most companies make with software outsourcing. During Phase 1 of the software outsourcing lifecycle, Accelerance works on-site and remotely with your key leadership and stakeholders to assess organizational readiness for software development outsourcing. We guide you through 2 critical areas: mitigating risk and establishing a plan. Part 1: Accelerance Baseline is our proprietary approach to risk assessment for your software outsourcing engagement. We’ll examine multiple factors in three key areas: business, technology, and management. Part 2: Accelerance Prepare, establishes software development goals and documents a plan for outsourcing execution. Risk Assessment Report that includes a mitigation plan to address identified risks, and reinforce good habits and processes. Product Outsourcing Charter that establishes product definitions, success metrics and software impact. Want to know more about Planning Software Outsourcing? Work with the best software development outsourcing companies in the world. Deeply vetted, certified for outsourcing capabilities - and perfectly aligned to your needs. Most business and tech leaders take a surprisingly casual approach when choosing a remote team. They often rely on informal referrals from their extended network, which presumes that their projects and goals involve identical verticals, tech stacks, team sizes, certification requirements, time zone alignment, budget, and so on. Accelerance clients benefit from a more formal approach to Partner selection, mitigating or eliminating the inherent risks through a more rigorous, systematic, and efficient approach. Accelerance starts with the information gathered in Phase 1. We understand your internal preparedness for outsourcing and we’ve established important definitions for your software development. From this understanding, you’re about to experience powerful difference of the Accelerance Global Network. Learn to increase speed to reach milestones and control costs with good alignment and outsourcing management processes. Software outsourcing projects that fail are riddled with unmet expectations, poor communication and escalating costs. Phase 3 of the Accelerance Software Outsourcing Lifecycle is designed to help clients avoid those risks by guiding clients and partners through proper alignment and outsourcing management practices. Part 1: Accelerance Align is the bedrock for generating consensus and clarity. We’ll facilitate a two- to three-day Align workshop for you and your Partner on-site at your selected Partner’s location. Part 2: Accelerance Embark is a 90-day partnership that helps you and your partner start right, create accountability and achieve early wins. Accelerance works with both your team and your selected Partner to execute your software outsourcing plan. Want to know more about managing your software outsourcing vendor? It might not surprise you to learn that not all software outsourcing relationships that BEGIN well stay on track and continue well. It’s too easy to for a customer or vendor to drift off course. With Accelerance, we’ve got your back. Phase 4 of the Software Outsourcing Lifecycle is designed to help our clients and partners maintain focus. We ensure your investment in software development outsourcing continues to be optimized and prevent risks from being introduced. Part 1: Accelerance Advance is 90 day support to maintain your outsourcing momentum (repeatable as many times as you want it.) Your Accelerance advisor meets with your team and your partner every week for 13 weeks via video conference. During these video conference sessions, we assess the current state of your outsourcing engagement, discuss potential oncoming challenges, keep a lookout for risks ahead, and provide advice backed by nearly 20 years of software development outsourcing experience. Part 2: Accelerance Optimize - our ongoing commitment to your success. For the life of your engagement, Accelerance conducts a quarterly diagnostic to review processes, productivity, culture, and communication. It’s our way of making sure your outsourcing expectations are met over the long term. When you’re an Accelerance client, you’ll work with the most qualified engineers in the world. It’s a big claim, but it’s true. Accelerance is the only outsourcing advisory firm that conducts deep vetting of thousands of global software companies. We certify our selected partners across more than 500 criteria. And, we’re the only advisory company that travels the world to verify our findings on-site for each and every partner. This means perfectly aligned partnerships, no surprises and less risk for our clients. Why Accelerance for your Software Development Outsourcing? Watch the video in under 90 seconds. Don’t let unnecessary risks minimize the value you deserve and need to get out of your investment is software development outsourcing. Make sure that business objectives for your software development project are fully realized. Accelerance advisors help you plan for your software outsourcing engagement. We help match you with the best-fit partner for your needs and your company. We support your team through the entire engagement - from kickoff to closure.